Immigration Entry Assessment Fee | Cascadia Hotel and Suites Scam - Gateway to Canada | Canada Immigration Consultancy! From Canadian Immigration Consultancy Facebook Page, somebody posted a question on how to pay the Immigration Entry Assessment Fee. According to him, he is a direct hire and is being required to pay the £380 assessment fee to continue the process. I suspected right away that it's just a scam. 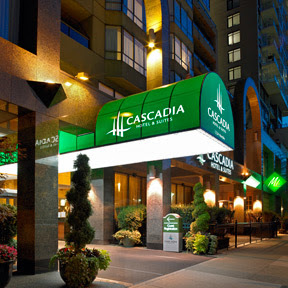 So I asked him what's the name of the employer and he said it's Cascadia Hotel and Suites Vancouver in British Columbia. Our mandate is to protect the consumers of immigration consulting services and ensure the competent and professional conduct of her members, assessment for migration to Canada, US, UK and HSMP in program. We have our administrative offices around the globe. We have been Chosen to handle group/participant from around the globe as regard entry into Canada and the UK. We the members and board of the Canada Immigration Lawyers, are inspired to take charge of all Candidates for re-allocating, and working abroad or subject to the Cascadia Hotel & Resort in accord with your file as regard your entering into Canada. Candidates are therefore expected to reach us with the following requirement for your approval letter which you will take to the Embassy for your visa procurement. Please be inform that your Embassy Appointment date will be scheduled With the Canadian Embassy as soon as your file is approved for entry. We therefore advice that you endeavor to reach us with your entry requirements so we can proceed with your approval entry authorization and all necessary arrangements with the Embassy. Important Note: Without your file approval, contact cannot be made with the Embassy for your appointment date with the Embassy. B) A passport photograph attach to this form that will be placed in your file which will be send to the Labor Department for an official approval for your entry permit (those far from Canada). C) Immigration Entry Assessment Fee £380 GBPounds only see attachment. In word (Three Hundred and Eighty Great British Pounds Only). However you are expected to download the payment form to open, print-out, fill and return same to us along with an official immigration consultant fee of £380 Great British Pounds. Meanwhile, if you are applying from a distance place-you should endeavor to reach us with the above mentioned requirements via email as these will enable us speed up your screening process. You should endeavor to send your immigration assessment fee with all instruction on or before 20TH July 2011. Payment transfer slip should be forwarded to us immediately payment is made and a copy to your Zonal Coordinator. Endeavor to reach your Zonal Coordinator with your assessment fee on or before the 20 -07- 2011. Finally Candidates who could not send the entry requirements should write a letter of withdrawal so we can terminate your visa application process as inline to the Canadian immigration entry regulation. Note that refundable policy is made available to all applicants that has paid and could no longer continue due to unexpected or ill health. It is no doubt one of those online scam. Most of the time they use names of a legitimate companies and lawyers but with a fake free email account. To legally work in Canada, you don't to get in touch with a Zonal Coordinator for the Immigration Entry Assessment Fee. Be informed. Don't be a victim. Spread the word. Let's fight online scam!